Sulfate, on the other hand, is important in promoting liver detoxification. Combined in a hot bath, the chemicals help produce serotonin, the “happy hormone” that promotes a feeling of calm and relaxation (4). 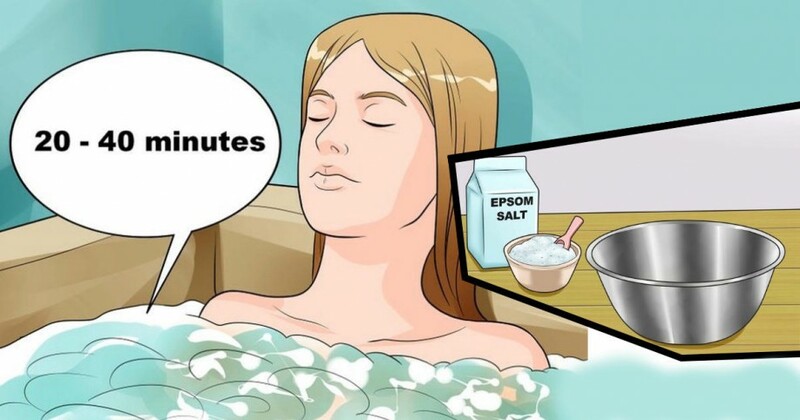 Most Epsom salt packaging recommends using 2 cups of Epsom salt in a well-filled bath and soaking for 12-15 minutes. However, David Jockers DC, MS, CSCS recommends that the quantity of salt you use should correlate with your body weight. He also suggests soaking for 20-40 minutes. The first 20 minutes pulls out toxins while the next 20 allows the body to absorb the minerals. For every 50lbs more – add an additional ½ cup of salts. To boost detoxification, use a dry brush for 5 minutes or so to move along lymph and open your pores. Add ½ cup of raw unfiltered apple cider vinegar for an extra-deep detox. For a relaxing bath, add a few drops of essential oils like lavender and add a few tablespoons of baking soda. To hydrate skin, add a generous amount of coconut oil.